Thai Singha is one of a couple of Thai places within a relatively small radius close to Rittenhouse, and they are known specifically for their incredibly cheap steam-tray lunches from Monday to Friday for around $6. I have dabbled, and found them to be cheap. That's about it. So I wanted to check out some of their real food, and also satisfy the hole in my soul that only lemongrass soup can fill. The Mom and Pop that run this place are incredibly cute, and they are also pretty much hilarious. See below. So the first order of business was some Tom Yum. They call it lemongrass soup, but we know what it actually is: a slightly spicy sweet and sour broth, large straw mushrooms, cilantro, scallions, and with (an awfully generous) five shrimp, the $3 price tag made for a pretty satisfying starter. I really love the funkiness that the fish sauce offers this Thai staple. The soup came out right away, and while I was waiting for my entrees, I threw an order of veggie spring rolls into the mix to tie me over. Keep in mind, when you are ordering from the À la cart menu, everything is made to order, so it may take a little while for your noodles to come out. The spring rolls were just about the same as any others I have had. Fried, vegetabley, and served with a standard sweet and sour sauce. Two go-to's when I am trying a new Thai place are Pad Thai, and Drunken Noodles. These are not very exciting, but when done well, they indicate a kitchen that will probably make a mean curry. Neither are very complicated, but they require finesse, otherwise it gets real heavy, real quick. Not to mention bland. They ask you how spicy you would like your order. I said very spicy, but I know they were holding back. I don't want American spicy, I want Thai spicy. I wish there was a discerning way to convey this when ordering at Asian/Indian restaurants. The broad, drunken noodles with chicken were pretty tasty, not overly heavy, and had a nice depth of flavor. I could have used some more heat (even though I added extra chili sauce), but overall, not a bad version of this hybrid. The crispy tofu Pad Thai was also pretty tasty. Again, nothing mind blowing, but a solid offering nonetheless. The tofu was nice and crispy, and they certainly did not skimp on ingredients. This place is incredibly tiny, and the owners are pretty amazing. I would recommend coming here on an off hour, or for takeout (call ahead). The prices can't be beat. This entire meal was around $20 and I had enough leftover for later. It's no Circles Thai, but it's a cheap, quick fix for Center City. I don't get the chance to make dinner as often as I would like, but on this presidential holiday, I decided to throw down some homemade banh mi's to practice for a Vietnamese hoagie party I am planning in the near future. I have made hoisin meatballs before, but this time I adopted some of the recipe from Bon Appétit's hoisin glazed meatloaf in the March issue. Basically you can follow their ingredient suggestions (I also add some gochujang, soy sauce and hoisin to the meat mixture, and shape them into meatballs. I then baked these off on an baking rack over a sheet pan for maximum surface area crispiness. This recipe makes about 35 meatballs. Dice and fry the bacon. Shred the bread and soak in chicken broth. Prepare the veggies and throw them in with the bacon when it is just about done, cook until veggies are just soft. Add all ingredients together with the bread crumbs and mix thoroughly. Here's where you decide whether or not you want bite-sized balls, or a whole loaf for slicing later. Prepare the meatballs by using an ice-cream scoop to portion even sized pieces of the mixture and form. Place on oiled baking rack about 1.5 inches apart, bake at 400 until internal temp is 165 and outside is nicely crispy. Prepare your roll with some mayo (I added lime juice, garlic, and red pepper spice), a little pickled salad (I made a quick carrot and jalapeno salad with a pinch of salt, sugar, tsp. of grapeseed oil and 1/2 cup of rice wine vinegar), and fresh cilantro. You can lightly toast the roll if you like. 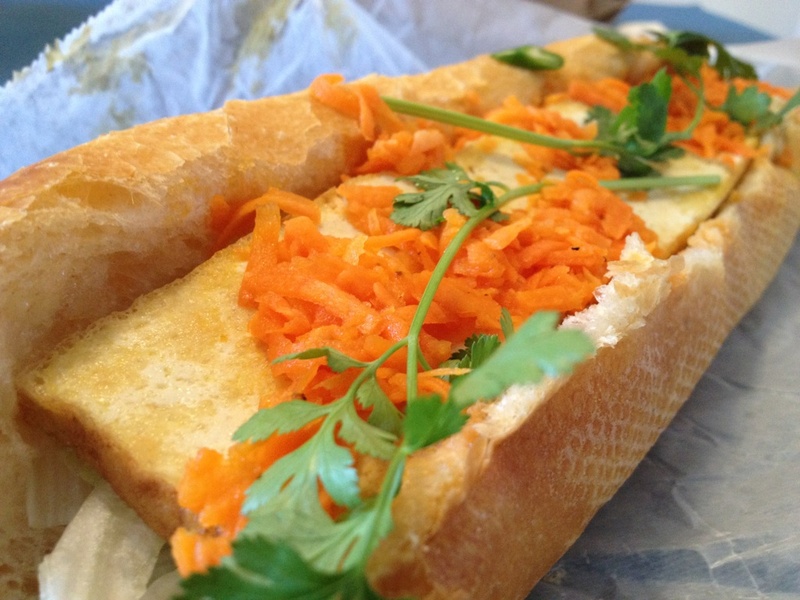 Simple, filling, and delicious, this was an excellent banh mi. The meatballs are incredibly juicy, crispy, and bursting with flavor. This is also a very economical dish, as you will get about 8-10 servings out of this recipe. Unless you are like me and eat ten meatballs for dinner. In which case you will get 4 servings. After my last Point Breeze Mexican pizza disaster, I took the commentators' advice and gave it another shot. This time I targeted Rosario's. My one gripe was that, although they have a variety of regular style slices, they do not offer Mexican style pizza by the slice. 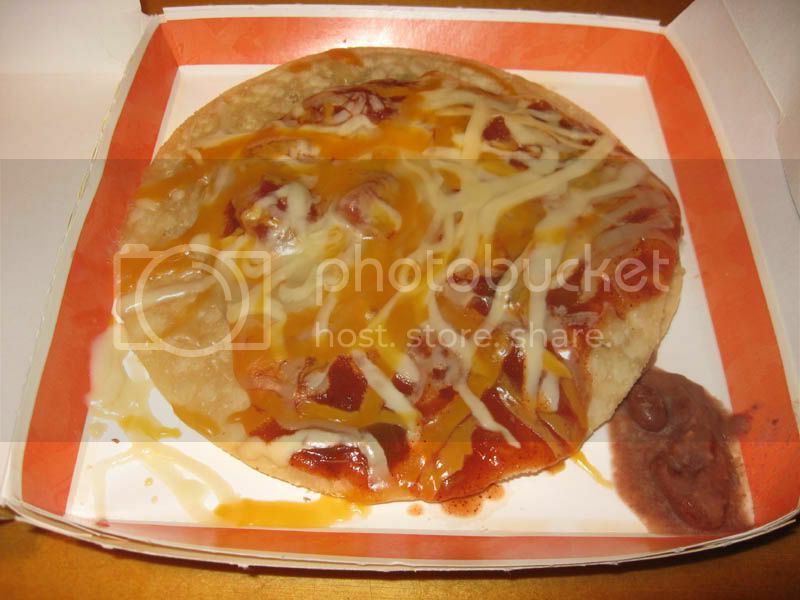 Keep in mind when I say Mexican pizza, I mean this, not this. So you must order Mexican pizza by the pie, which ends up around $10 a pie for a small. Cash only. I had to try the Al Pastor, which consists of Guajillo pepper sauce, mozzarella, marinated pork in a mild chili sauce, pineapple, chopped onions and cilantro. My first mistake was eating this right out of the oven. It was still a bit sloppy and the flavors had not had time to meld. After I ate my first two pieces, I remembered to calm down, and waited at least another 20 seconds before moving on to the next pie. The Al Pastor was good. The meat was well seasoned, the sauce was tasty, but lacked some of the smokey flavor I have come to expect, and it was altogether a pretty good package. More pineappleing would have been a plus, as it was feast or famine in the Ananas comosus department. I did like this pizza, but I find it hard to imagine a time when I would rather have my Al Pastor in pizza form rather than torta, burrito, taco etc. I also find it difficult to imagine when I might not be craving real pizza (Tiffin Etc. exception noted), and prefer it in Mexican form. I also tried a La Mexicana pizza, which boasted a salsa verde base, mozzarella cheese, and chorizo topped with poblano pepper, roasted corn kernels and fresh avocado. This one really hit a home run with the salsa verde base, it came through with a sweet and tangy punch. The entire pizza was delicious, although I could have gone without the large slivers of poblano pepper which pretty much just came out whole with each bite. The fresh avocado was another nice touch, although it definitely starts the still-good-for-leftovers clock ticking as soon as you get the pizza. I would definitely recommend getting a side of salsa with your pizza(s), the verde being my absolute favorite. It takes care of any leftover crust handily. Altogether, this is pretty good Mexican pizza. I certainly wouldn't be opposed to someone ordering it, on the rare occasion I'm in the neighborhood. The crust was okay, similar to Greek style pizza but the thickness was necessary to hold all the toppings without ripping. I am a sucker for Banh Mi sandwiches, especially when they are well crafted and cost about the same as a cup of coffee. Iron Tower comes in hot with a mere $3 price tag for any of the varieties they offer. What's more, they also offer crepes and a variety of desserts and drinks. These sandwiches are made to order, and the owner is enough reason to go as any. He makes the atmosphere there inviting, and takes great pride in his product. These things are made with love in his tiny shop. Cash only, but if you can't come up with $3 EVEN – then you have bigger fish to fry. I got a single tofu version, because I had literally just left Ramen Boy, dejected, and I wanted something to cheer me up. The fact that I could have gotten 4 of these little numbers, instead of just one of my bowls of broth, made me both sad and happy. Sad because I could have gotten thirteen banh mi for less than I paid for two bowls of soup and an order of dumplings, but happy because next time I am going to get thirteen banh mi instead of two bowls of soup and an order of dumplings. The tofu was fried crispy on the crepe griddle, before being tucked into a crispy french roll. Luckily I had just eaten so I was able to hold off on inhaling this until I got home 5 minutes later. Its no small sandwich for the price tag either. Keys below for perspective. The tofu was crispy, the pickled carrot added a touch of acid, the shredded iceberg provided some crunch, and the chili peppers gave it some heat. You can order mayo or oil, I obviously opted for mayo, but was still missing some pate or spread of some sort. If I had known previously that there was an option for spicy-bird-chili, I would have been all over it. Next time I am gonna go BBQ and see how it stacks up – because unlike Ramen Boy, Iron Tower will be seeing me again. Overall it was a great sandwich, fresh, crunchy, filling and cheap as hell. It looks like QT has met its Chinatown match.